So there I was, tapping away at the keyboard, enjoying my new-found self-appointed career as a food and wine journalist dreaming up idea after idea of posts to like, retweet, memes to create, memes to share, people to poke, chats to follow, inside jokes to make, hashtags to use…you know the typical stuff one does when one doesn’t really want to earn a living. Then startlingly I received one, possibly my first ever, guest comment on my blog from someone at McCue Communications. Mon Dieu! She wanted me to give her my information so she could send me some wines to try. They were actually going to send me wine? Huh? What’s the catch? Ah ha….so that’s what this is all about. This was a similar epiphany to the day I realized that golf was more about betting money and drinking beer with the “fellas” than it was about golf. I gave up golf too soon to fully partake. Quelle dommage. Being accustomed to buying and reviewing wines of my own volition, I was concerned about my freedom to express an opinion untethered by wine sent gratis. What do I do if they, ahem, are not so good? 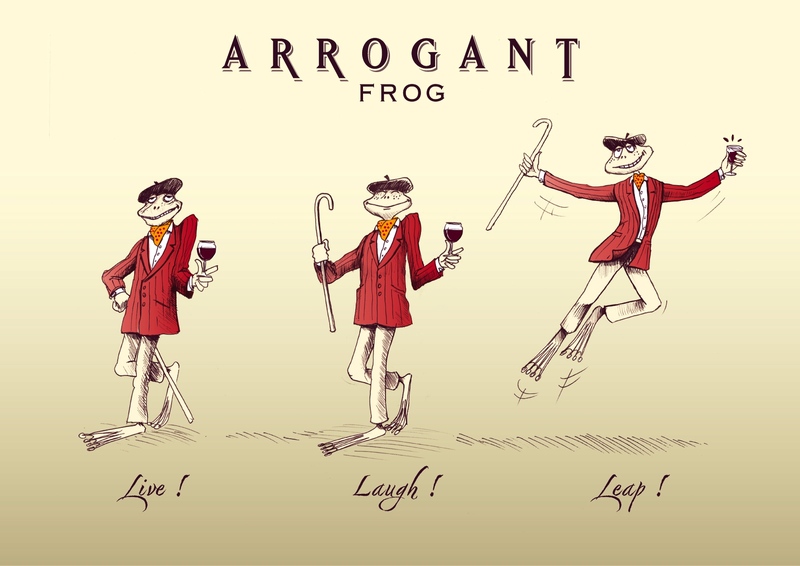 Luckily, the Arrogant Frog wines by Domaine Paul Mas made my job much easier and euphemistic free. Moreover, I had the pleasure of tasting with other wine writers I deeply admire including Sir Jeff Siegel winecurmudgeon.com, Michelle Williams rockinredblog.com and Beth Smith travelingwinechick.com – who happens to be my neighbor so we made a lunch date. It was a privilege to partake in the virtual tasting with fourth-generation vintner Jean-Claude Mas to learn about his latest value vintages. His family has led premium winemaking in the Languedoc region from their centuries-old estate since 1892 and when M. Mas took the reins in 2000, he dedicated his wine making practices to preserving the land and the beauty of Languedoc. In 10 years, he plans to transition all 8 of his family wineries into organic vineyards that employ natural farming principles through the use of the latest technology. This has already reduced the need for pesticides and other chemical based agricultural practices that can harm the natural balance. “We must preserve the beauty of Languedoc, and feed the Earth with nutrients in the way nature intended. The use of chemicals for the past 50 years has stressed the vines and now we need to use technology to bring us back.” In summary, it is about making old world wines with new world attitude. C’est tout! 1. He prefers new American Oak to French Oak – definitely a new world attitude. 2. He believes advancements in agricultural technology will replace the need for chemicals – hooray! 3. He believes a vacuum wine stopper is “utter stupidity” – good to know. 4. 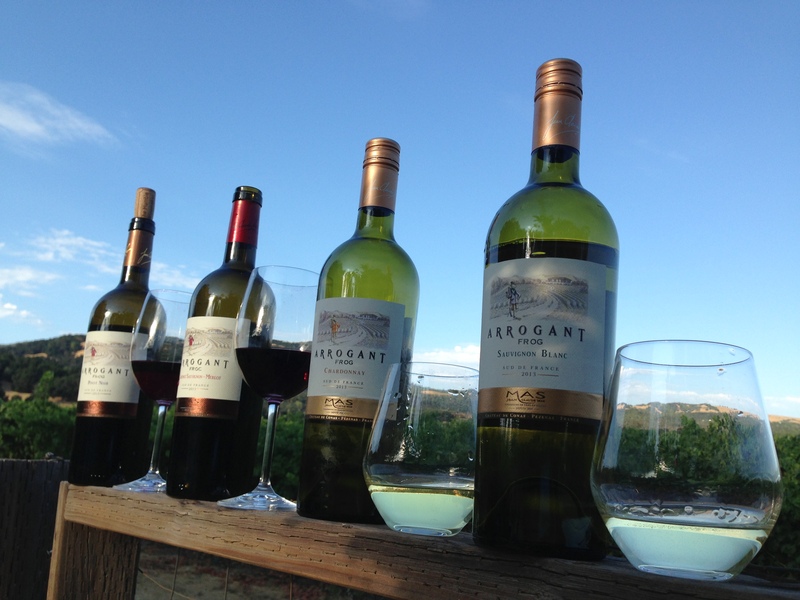 The Frog on the front of the bottle is the “humble wine maker” – I chose to name him Hubert de Vin-chy. 6. He believes all his wines taste even better after 24hrs. I agree. 7. His style of wine making is not aggressive but soft due to the ripeness of the grapes in the South of France. 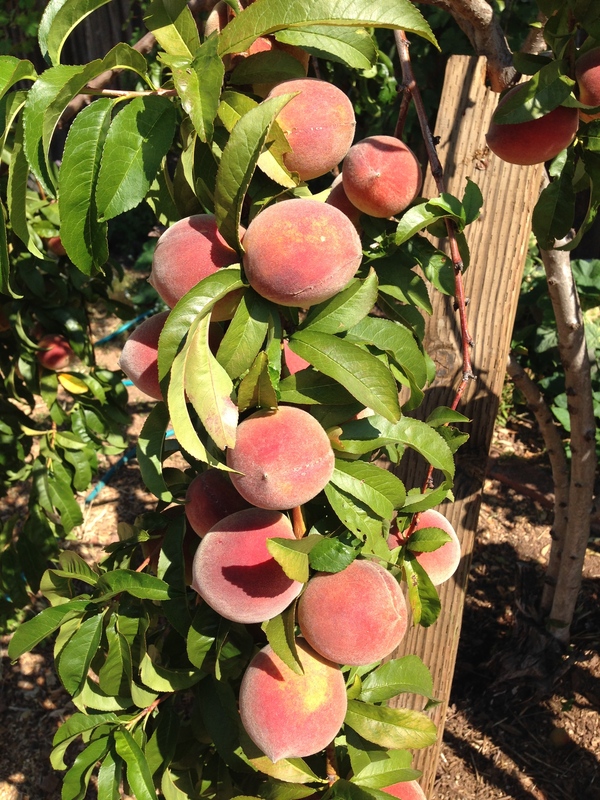 The peaches are nearly ready to be picked, grilled, doused in cream, baked into a rustic tarte, made into ice cream, eaten off the tree – ahhh Summer. The first thing I detected in the nose was lemon and grass. First sip is crisp, citrus and bright – reminded me of a New Zealand Sauv Blanc vs. the California Sauv Blancs I enjoy at this price point which can be more fruit forward. I enjoyed this wine and found it had a nice bright mild acidity and a smooth finish that was a touch buttery. It was very enjoyable. For $10 at retail, it would be a challenge to find a wine of this quality for a better price – I’d buy it again. I’m about to harvest my peach trees in a couple of weeks so I think this will pair perfectly with some grilled peaches and a cheese board of aged cheddar, gouda and a Humboldt Fog. Coq Au Vin recipe anyone? The color was dark garnet with a red-brown halo, which was unusual to me. There was a comment made about this being a “refreshing” Pinot Noir. As it was a warm climate Pinot, when slightly chilled, one can appreciate the delicate flavors of cherry and very light oak. Due to the warm climate in Languedoc, the Pinot grapes mature fast, unlike classic Pinots (like on the Sonoma Coast) that mature slowly. M. Mas explained that he takes great care in deciding where these grapes are planted to ensure the best result, although he did admit, this Pinot was unlike most typical Pinots. I found it very unexpected. I let it open up the next day and albeit pleasant, it was not necessarily the right flavor profile for this Pinofile. 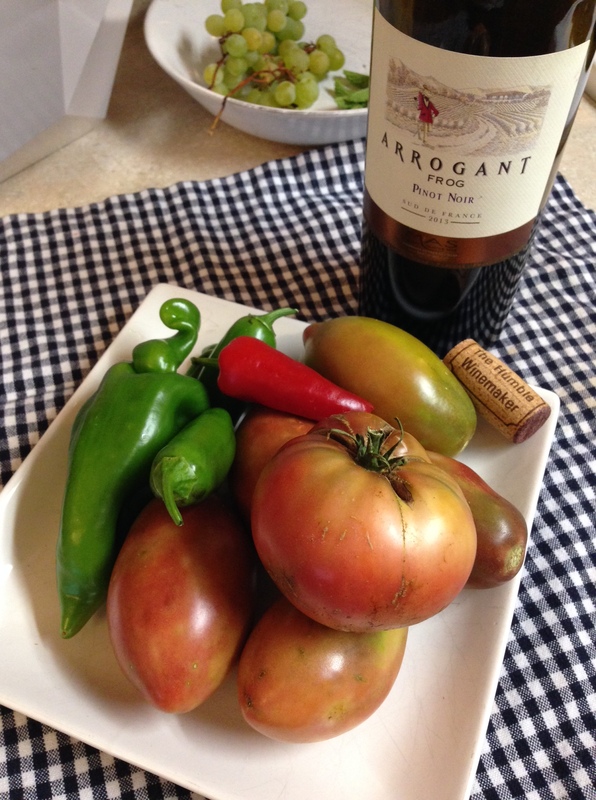 I would say it was respectably drinkable and it was fantastic the next day for braising chicken with tomatoes and peppers picked from my garden in my Le Crueset for hours and hours and hours – delish! What little wine there was left, did sip nicely with the meal. The nose was immediately and undeniably pineapple. First sip was lemony with a light oak finish – 25% of this wine was aged in Oak which contributed to the lactic character on the mouth which is the toasty flavor the oak expresses through the wine – some refer to this as creme brûlée. I enjoyed this wine and it was an outstanding value for $10. This Chardonnay was aged in American Oak which was quite intriguing to me. When I asked what the difference was between American and French Oak M. Mas explained that the American oak gives more lactone resulting in more toasty vanilla notes than the French oak which is more subtle. When the oak is very dry, it does not dominate the character of the wine. (Note to self, more wine knowledge to be had in the procurement, aging and use of oak in the wine making process. I found a succinct post on thekitchn.com about French vs. American Oak) In Mediterranean made wines, the American oak is preferred as it lets the wine breathe less and is better when aging very ripe grapes. As M. Mas explains “in Languedoc we can pick the grapes when we want, not when we can. Think about that…” I think this Chardonnay is a delight. An everyday luxury I would buy again. Nose is blackberry, blueberry, dark fruit. First sip is spicy, cocoa, vanilla, coconut and raspberry. Nicely complex and toasty from the US Oak. Soft, round not aggressive and very refined tannins and acidity. This wine is excellent with dessert, especially chocolate! Rich and bold, this wine could easily pass for a $40 bottle of wine. When asked about how the cocoa flavor was achieved, M. Mas answered it was from the ripe fruit and the American Oak. This wine is a buy again. I don’t want this wine, I need it! Very nice article. Thanks for the shout out. It was a fun event! Cheers! It was a blast and in my snooping around the Frog is quite animated and active around the world. I now follow his blog.